If someone came up to you and said they were from a parallel world - in fact came from the same city you were living in but with a different name and history - a city that was at war with the French (The Gauls) you'd back away right? Find an excuse and run. It's uncomfortable talking to someone who probably believes aliens are controlling their mind or at least Trump's mind (oh shoot - that bit's true, sorry). Anyway you get my point. So that's how Girl With Cat (Blue) began. No, not aliens - but standing in a Vancouver Gallery before a beautiful painting of a girl from another planet, her loyal Blue Cat at her feet. I talked to the artist and he claimed he'd dreamt this girl was real and spoke to him and she insisted he had to paint her. Crazy? Possibly. But as I walked back to my Kitsilano apartment I was intrigued. Months later – I too was visited by the same girl in my dreams. She crouched in my window and berated me for not writing her story. The vision was so real I can still see her there with an extremely a cross expression on her face. I was then living in an apartment six floors up and it was impossible for her to be there, or real, but nevertheless it was inexplicably detailed right down to her cracked leather boots and blood-stained scarf. 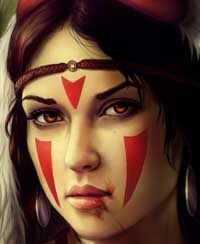 I began to think about her a lot and once I discovered her name - Saska - I began to write. But if Saska existed in a parallel world then it was likely that she would have a doppelganger in this world! Once I found Jules with her sidekick McReady and the knife-wielding Ratkin, Merry appeared I had everything I needed to get started. But then everyone knows that if you meet your doppelganger one of you must die.... The strange thing is – I didn’t actually get really started on this book until I’d written several others. I knew it would be a big adventure and would need a whole lot of time and research to write it. Nevertheless Saska was always there in the back of my dreams – still waiting – still fighting – still surviving best she could – still impatient. Only when Jules and Kye disappear into a solid brick wall in Holland Park does he finally accept it could be real. But then what on earth can he do about it? For me, writing a book set in present day London and an alternative London called Lundein gave me permission to explore two timelines – create a new history. Of course, Lundein is in Inglund. It is more 19th Century than 21st - scientific progress has gone in different directions. But now it lies in ruins. Saska is the last line of defence. She meets with Merry, the Ratkin, a child ratkiller abandoned by the city. Together, with Cat they must fight the enemy. She has long wanted to follow in the footsteps of her brother, but has never found the mysterious tunnel he and others allegedly took to escape. In fact she’s come to believe that it never existed, it was just a myth to give comfort to those who remained. This London they talk of is a terrible lie, a myth, and her brother lies dead in the rubble, just like her parents. Lundein isn't the only other version of London. McReady discovers another, even more lethal as he begins his search for Jules. If there are two multiverses - whose to say there aren't 20? The tunnels are passages to specific places in time. If you can read the map you can go forward or back; but this is forbidden knowledge and as Saska discovers, her own Uncle as guardian of the secret, betrayed them all. Saska's main ambition is find the man responsible for killing her city. She is tough and resilient. McReady just has to keep everyone alive. 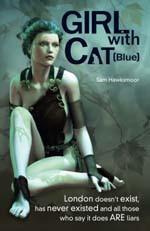 I can't say more, but I hope you too will be haunted by the Girl with Cat (Blue).